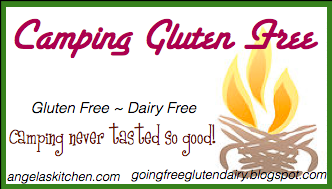 Camping Gluten Free – Donuts or Doughnuts? It is time for another installment of Camping Gluten Free! Becca of Going Free hosts this week with a yummy Gluten Free Dairy Free Doughnut recipe you can make while camping. So fun! Do you call them donuts or doughnuts? I never know which to call them… LOL! Whatever you call them, I call them delicious! Be sure to stop by Going Free and see the tastiness. Need other camping food or camp food ideas? I have more here. Do you backpack, car camp or head to a camp-type facility with a kitchen? What are your favorite camping foods? Camping never tasted so good! Tough call, but I'd say GF should be donuts. :) I usually say doughnuts though. Delicious either way!